Governors Island is a 172 acre island in the heart of the New York Harbor, across lower Manhattan and Brooklyn. I've written about the island in a previous blog when I first visited in 2012. The island is currently in full swing for the construction and development of a new park and public open spaces. When it will open to the public in May 2014 a huge portion of the island will be entirely different from what it looked like before. After the federal government sold the island to the people of New York, the city created the Trust for Governors Island, the organization charged with the operations, planning and redevelopment of 150 acres of the island. The remaining 22 acres were declared the Governors Island National Monument and is managed by the National Park Service. The Trust is transforming Governors Island into a destination with great public open space, as well as educational, not-for-profit, and commercial facilities. Construction has been completed on 30 new acres of park and public spaces that will open for public use in May 2014. In summer of 2013, The Trust broke ground on the Hills, the crowning feature of the new park. Made of recycled construction and fill materials, The Hills will rise 25 to 80 feet above the Island, and the summit of the tallest Hill will provide visitors with a 360-degree panorama of the Statue of Liberty, New York Harbor and the Lower Manhattan skyline. Last year I went to Governors Island on the first day it opened in May, visited again in July and in September, on the last day before it closed its 2013 season. When I went there on its opening day in May, the first improvement at the island can be seen from the ferry, in big white letters. Another new development is the Welcome Wall at the Soissons Landing which provided visitors with a directional map and information. Going around the island, I spied the bicycles for rent parked and lined up for the visitors to use and enjoy. Nobody used them that day, however, as it was still cold and very windy. I also had the chance to go around the barracks buildings inside Fort Jay, one of the two forts in the Governors Island National Monument. Lady Liberty was also a very welcome sight that day although access to the area of the island directly across her was restricted due to the ongoing construction of the new park. I have read some articles about the Governors Island expansion so I proceeded to Liggett Hall to see the ongoing development. Inside the arch, as you can see in the above picture, was a small temporary structure where visitors could stand and gaze at the ongoing development. There was also a before and after poster so people can have an idea what the new development would look like. So I stood on that temporary structure that cold day in May last year and gazed at the ongoing development. Nothing much to see at that point but the base of some structures. I'm sure a lot of development was going on in areas not visible from the arch. To my right was still more development and a great view of Lady Liberty. It was just the first day of the 2013 season and I know I'd be back. Even if it was cloudy that day and the air still so nippy, Governors Island always has one of the best views of lower Manhattan across the harbor. Summer was already in full swing the next time I was able to visit Governors Island in July 2013. It was the City of Water Day and most of the free boat rides originated from the island. There were many visitors, picnics and bicycle rides seem to be the order of the day. Governors Island is home to Figment, an annual participatory arts event that aims to provide a forum for community-based art and experience. Last year, the star of the show was the Head in the Clouds Pavilion which was made of 53,780 recycled bottles – the amount thrown away in New York City in only 1 hour. 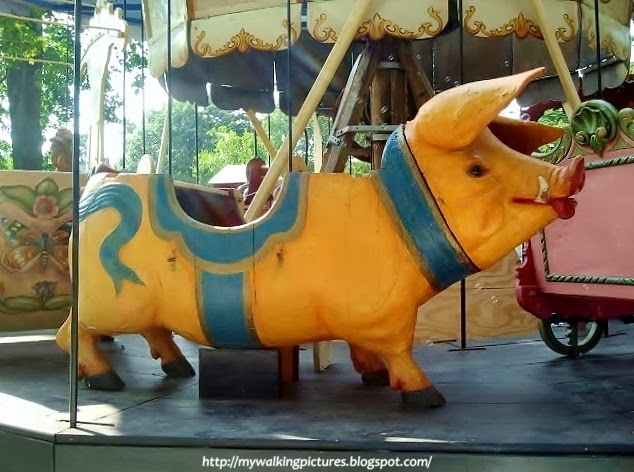 As I continued to walk around the island, I chanced upon this delightful ride in the form of a pig. It was one of the rides in Fête Paradiso, the world’s first traveling festival of vintage carnival rides and carousels which made its American debut on Governors Island last summer. I had a previous commitment that day but still stayed to get some shots and enjoyed the carnival atmosphere. The vintage rides and the games were awesome! You can see the rest of the rides in my Flickr album Fete Paradiso at Governors Island. I also checked on the ongoing construction of the new park. The most obvious difference from my view at the temporary structure at Liggett Hall was that Building 877, the largest non-historic building on Governors Island, was no longer standing on the site it once occupied. It was imploded on June 9 to make way for the new park. You can watch a video of the implosion on this link. As usual, Governors Island offered a great view of lower Manhattan shining across the New York harbor. September 29 was the last day the island was open for the 2013 season and it was Park Preview Weekend. The public was invited to see the transformation of acres of landfill into an incredible park. Liggett Arch was the gateway to the new park which opens to the Liggett Terrace. The Arch opens into Liggett Terrace, a great urban plaza made welcoming by flower beds and mosaics, plantings, art, seating, cafe carts and play structures. From the Terrace, the Hammock Grove and the Play Lawn unfold beyond, with the promise of the Hills in the distance. There were posters showing the proposed development and how the area looked before. This red hammock is the first one to grace the Hammock Grove. I can't wait to try out all the hammocks next year. The Hammock Grove provides an area of filtered light and shade between the cultivated sunny space of Liggett Terrace and the open expanse of the Play Lawn and the Hills and Harbor beyond. Visitors come to the seven-acre grove to enjoy the seasons — spring’s first leaves, summer shade, and fall leaf colors. Hammocks set in the shade of the trees offer a quiet way to relax and the inspiration for this area’s name. Hammock Grove offers a wonderful respite and chapter in the park’s unfolding topography and views. Hammock Grove contains 300 new trees representing 55 species. There were already a lot of planted saplings in the new park but I still saw some areas intended for trees that weren't planted yet. I know this would be a wonderful place as the trees grow and branch out. And I'm happy to see this note. Isn't it cool? "The tree are being planted in a grid so that the Statue can always be seen." The trees were planted inside an area enclosed by pre-cast concrete which can be used as a seat for park visitors. These concrete pieces are manufactured in Buffalo, NY. Walking further into the park I saw lots of construction equipment and materials while Lady Liberty peeked beyond the mountains of sand and gravel. This area would be known as The Hills. At the top of the highest hill, visitors are rewarded with an extraordinary 360° vantage point on the City, the Harbor and its icons. In a city of exceptional views from skyscrapers, the height of a nine-story building would offer little of distinction. On Governors Island, out in the harbor, the height of an 82-foot hill offers a sensation, even a thrill of a view never seen before, never even imagined. This is still part of The Hills, at the time of my visit work has started as you can see from the signs attached to the fence. If the views from the island at ground level are awesome, how much more from the top of The Hills? I also saw this beautiful rendition of what the Play Lawn would look like once the development is finished. The Play Lawn is an 11-acre green expanse where children and adults play sports, soak in the sun, roll around on the grass, grill, and gather. Whereas shady areas can be found nearby in the Hammock Grove, trees will dot the Play Lawn only occasionally, keeping unobstructed areas for play and openness to the sky, sun and Harbor. As I gazed at Lady Liberty, I saw some ongoing construction work being done. This was probably part of the development for Liberty Terrace, which would be right across the statue. Liberty Terrace connects New York City to the Statue of Liberty. Standing on the Terrace, the visitor sees Lady Liberty’s face in person, perhaps for the first time. As visitors tour the Great Promenade, from either direction, the Statue comes in view, as a surprise when rounding the South Prow, or first in profile on the Island’s western Promenade. As cyclists head south or pedestrians meander through the park, the trees, hills and lawns frame views of the Statue, all culminating at Liberty Terrace. Certain parts of the park weren't available for the park preview so standing at the southmost edge of the area that was open to the public that day, I took this pic. This was my view gazing south, to where the South Prow would be located. As the Great Promenade rounds the South Prow, it splits into two levels. The Great Promenade’s upper level curves inward to form the South Prow Overlook, which is elevated seven feet above the Wetland Gardens and picnic grounds. From the South Prow Overlook, the Wetland Gardens and Picnic Grounds unfold like a carpet of water-loving plants and green lawn framed by the blue- gray water, sky and Statue of Liberty beyond. The elevation creates a new perspective on the sea and sky, a 180° view that complements the 360° views afforded by a tour of the Grand Promenade or a walk to the top of the Hills. From where I was standing that day on the southmost part of the park open to the public, this was my view looking back at Liggett Hall. On the way back I passed by some of the spaces designated for the play area of Liggett Terrace. Liggett Terrace is a wonderful place for young children and their families. A play area provides climbing and swinging activities while reflecting pools offer children a chance to get wet or play with toy boats. And of course, I can't leave Governors Island without taking a picture of lower Manhattan across the harbor. Thank you Governors Island for inviting the public to the Park Preview. I can't wait for the whole development to finish. For sure Governors Island will be at the top of the list for everybody to visit once it opens for the 2014 season. 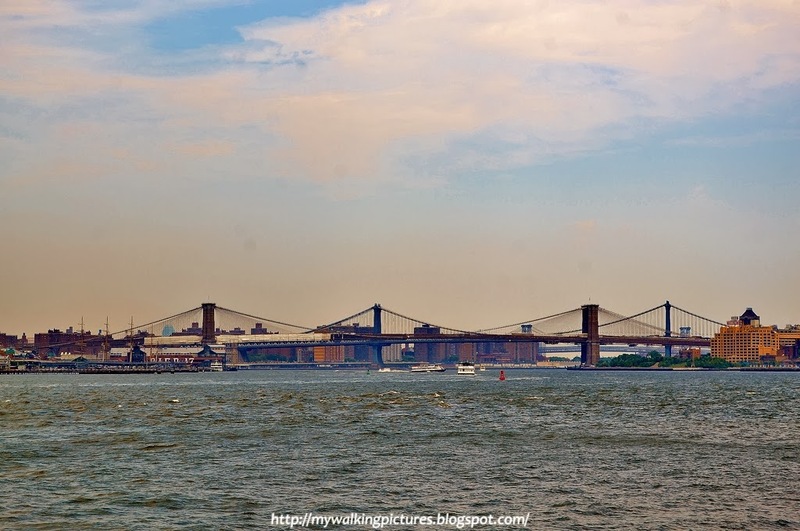 Last November I joined a group meet-up to walk across the three bridges that connect Manhattan and Brooklyn. Often referred to as BMW, the three bridges are the Brooklyn Bridge, Manhattan Bridge and Williamsburg Bridge. 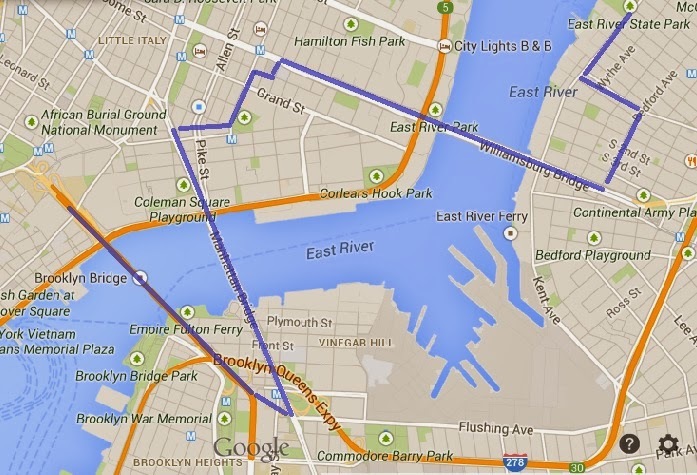 Brooklyn and Manhattan Bridges are near each other while Williamsburg is a little bit further. You can see the bridges in this photo I took while riding the ferry to Governors Island last year, even if only the towers of Williamsburg is visible. The group met at the Brooklyn Bridge/City Hall station subway stop which is right across the pedestrian entrance of the bridge. I previously wrote about walking across Brooklyn Bridge. It's always great to walk across the bridge, even if it was slightly raining when we started our walk that day. 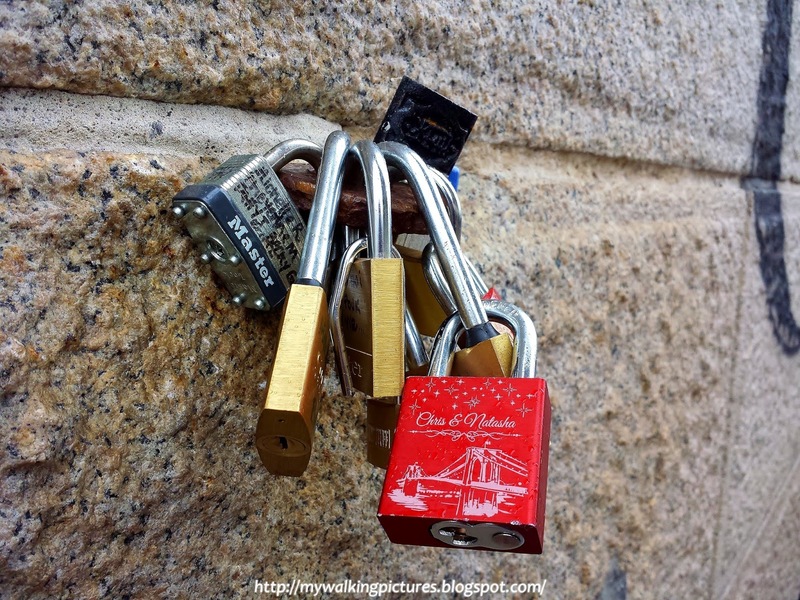 There are a lot of love locks on the bridge. I like the colored ones with the names printed, sometimes some of them even have designs of the bridge on the locks. A close-up of the bridge's overhead cable wires doesn't show the repair works being done which is expected to last until middle of this year. 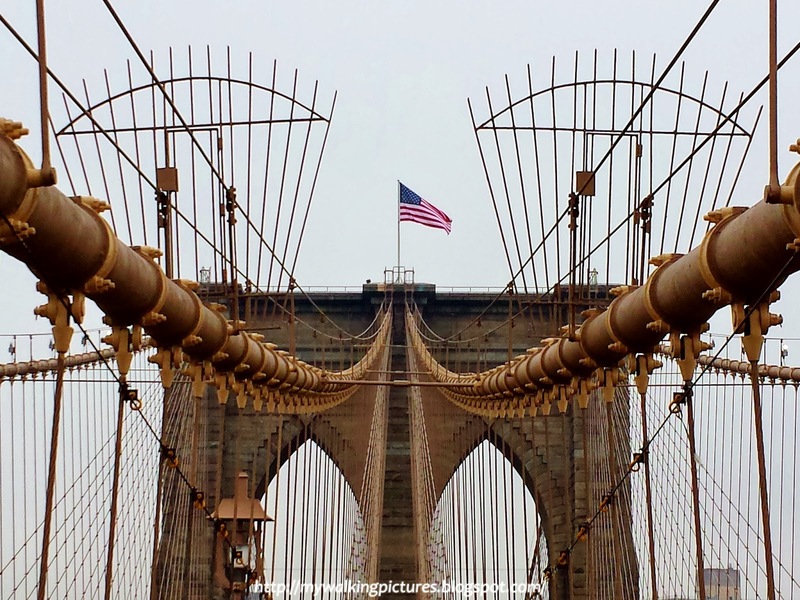 The cable wires always make a great picture of the Brooklyn Bridge. 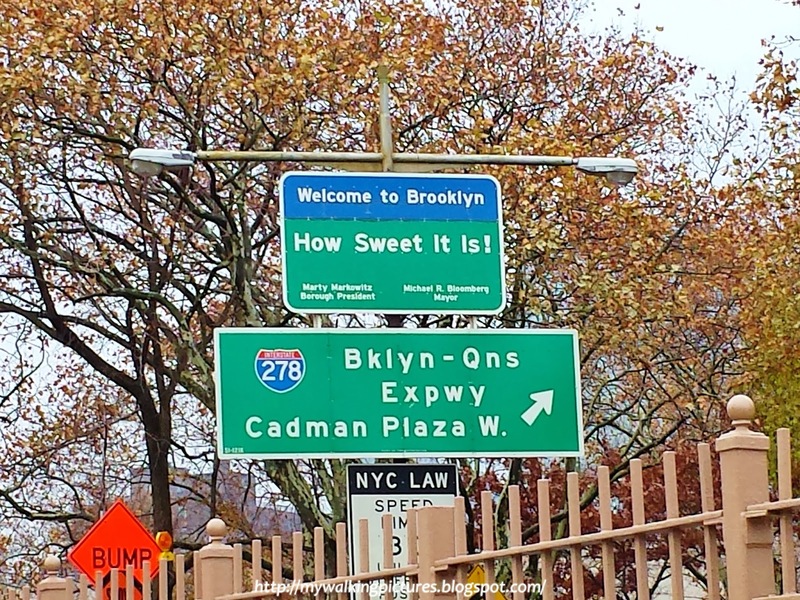 As we neared the exit on the Brooklyn side, I saw this sweet sign. After reaching Brooklyn, we walked just a few blocks to start the walk on our second bridge for the day, the Manhattan Bridge. Its pedestrian walkway has great views of the Brooklyn Bridge. I could see the whole bridge and a very foggy lower Manhattan. This was my view looking up at one of the towers of Manhattan Bridge. There are lots of graffiti on Manhattan Bridge. I could not even read the bridge data and names of those involve in the building of the bridge as the marker is full of graffiti. As we neared the Manhattan side of the bridge, I could see more graffiti on many of the buildings in the Two Bridges neighborhood. Soon we reached the Manhattan end of the bridge which is marked by the Manhattan Bridge Arch and Colonnade. In 1910, a year after the bridge opened, the architectural firm Carrère and Hastings drew up preliminary plans for an elaborate grand entry to the bridge on the Manhattan side, as part of the "City Beautiful" movement. Construction began that year, and plans were finalized in 1912. The arch and colonnade were completed in 1915. The decoration includes pylons which were sculpted by Carl A. Heber and a frieze called "Buffalo Hunt" by Charles Rumsey. That Manhattan end is in Chinatown. We walked several blocks in the neighborhood to get to the Williamsburg Bridge pedestrian entrance which is in Clinton and Delancey Streets. Along the way we passed by many of its business establishments and also its fire department, the Chinatown Dragon Fighters. We also passed by and stopped at Seward Park as some wanted to use the restroom facilities. A short walk around the park perimeter led me to a statue of Togo, the lead sled dog of Leonhard Seppala and his dog sled team in the 1925 serum run to Nome across central and northern Alaska. Then we were on our way to the Manhattan entrance of the Williamsburg Bridge. Here's the group walking in the light rain across the bridge. Looking up from pedestrian walkway, I saw one of the bridge's towers. There are also a lot of street art as we neared the Williamsburg end of the bridge. I like this American flag formed with car doors. Very original! We also passed by this huge mural by twin brothers How & Nosm. Our walk ended at the Brooklyn Flea Market where we bought lunch. Upon arriving, I saw this huge artwork Queen Mother of Reality by Pawel Althamer. The Brooklyn Flea is located inside the East River State Park which has great views of Manhattan, especially on clear days. However, by the time we arrived rain has fallen steadily and the fog over Manhattan has thickened. When I look across the East River, some of the buildings were no longer visible. After lunch I bade my leave from the group and boarded the East River ferry to go to Brooklyn Bridge Park. The ferry ride gave me a great view of the Williamsburg Bridge. When I got to Brooklyn Bridge Park, lower Manhattan looked hauntingly beautiful covered in fog. It wasn't as foggy in Brooklyn looking at the Watchtower building. I can still see the numbers on the LED clock. I walked a little bit at the park and when I looked out the New York harbor, Lady Liberty was a very faint outline in the thick fog. I proceeded at the back of the park's Pier 1 to walk across the Squibb Park Bridge, which opened in March 2013. If you walk across Squibb Park Bridge, you may notice a little bounce in your step. The bridge was designed with trail bridge technology and is meant to be lightweight and flexible like the trail bridges in our state and national parks. So whether you’re a first timer or returning visitor of the Squibb Park Bridge, expect an extra pep in your step and know that this is completely normal and part of the design. The bridge offers a great view of lower Manhattan, as well as the beautiful vegetation of the park. I could also see more construction work going on. I know when all the work is done, Brooklyn Bridge Park will be one of the city's best parks. I also dropped by the area at the park where visitors often leave love locks. Then it was time to head home. One last look at the park near Jane's Carousel with Manhattan still covered with heavy fog. It was also foggy at Manhattan Bridge, to think we were just walking there earlier. At the start of our walk across Manhattan Bridge, I saw artwork along some of the walls and promised myself to look into it. I learned that the artwork are part of Dumbo Walls. The DUMBO Improvement District has teamed up with Two Trees Management to bring art to the blank brick walls underneath the Brooklyn-Queens Expressway. Called "DUMBO Walls", the installation brings eight world-renowned artists to the Kingsborough, transforming disused space into an outdoor gallery. Artists CAM, MOMO, Stefan Sagmesiter, Yuko Shizimu, Shepard Fairey, Eltono, and Faith 47 added their signature styles to the walls with colorful, semi-permanent murals. Visitors can marvel at the outdoor art exhibition, which traverses the walkway near the Manhattan and Brooklyn bridges. Each of the eight murals signify the debut of the DUMBO Walls project, which hopes to transform other areas in DUMBO into an open air exhibition space. I like the owls at the Bar and Grill Park by CAM. And the reindeer by DALeast at the BQE Underpass on Pearl Street. That was a great walk even if it was raining and foggy. This is just a rough illustration of the paths we took on the Three Bridges walk but I'm posting this map to give you an idea where I walked that day.